A delegation from Sidra Medicine’s Heart Centre, took part in the 21st Annual Paediatric and Adult Interventional Cardiac Symposium (PICS-AICS) in the US. The event, which took place from September 5-8, was launched in 1997 by Sidra Medicine’s own chair of the Department of Paediatrics and Heart Centre director, Prof Ziyad M Hijazi. The four-day conference brought together experts in interventional cardiology who provided live demonstrations and shared the latest research breakthroughs for the treatment of congenital heart disease (CHD). The event attracted more than 750 interventional cardiologists from over 60 countries. This year’s edition discussed various themes including the use of 3D imaging for interventional catheterisation in CHD cases and the optimisation of the decision-making process during congenital interventions. Prof Hijazi, an interventional cardiologist who pioneered the Venus P-Valve procedure – a minimally invasive surgery that can substitute open-heart surgery for certain CHD cases via the implementation of a custom-made valve, shared insights on interventional surgeries. This included thoughts on innovations in the cath lab, as well as working with international manufacturers to develop medical devices. “This year’s theme is particularly relevant to Sidra Medicine, as the use of 3D imaging at the Heart Centre has enabled us to print exact replicas of patient hearts prior to surgery. This ensures that we have a thorough understanding of their anatomy and allows us to perform a low risk, highly precise surgery. To date, we have implanted over 200 Venus P valves for patients in Qatar and abroad,” said Prof Hijazi. Prof Younes Boudjemline, director of Cardiac Catheterisation Laboratories at Sidra Medicine’s Heart Centre and one of its leading specialists, along with Dr Hesham al-Saloos, associate director of the Cath Lab at Sidra Medicine, performed two cases at the centre in Doha, both of which were livestreamed to an audience of over 750 attendees in the US. The first case was for an atrial septal defect in an adult patient. The surgery included the placement of an Occlutech device through blood vessels in the groin. The second case was for a child who had a Patent Ductus Arteriosus, a congenital heart condition that affects blood flow in a child’s heart. The Sidra Medicine Heart Centre is one of the institution’s flagship programmes and is set to become a leading centre in the region for patients suffering from congenital heart disease. 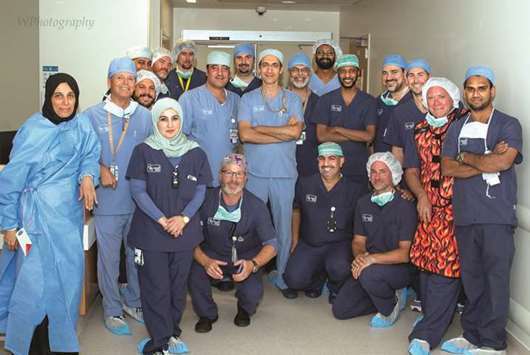 Patients in Qatar and the region now have access to high-tech equipment and an international team of experts able to perform the most complex cardiological procedures in Qatar.